There exist in Tanganyika Territory two groups of people known as Angoni. They reside the one in the Kahama District of the Tabora Province, and the other in the South. western area of the Territory, at and around Songea. 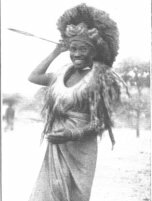 Since the Angoni are popularly supposed to be of Zulu origin, it is of interest to consider how these people have come to be settled in places so far distant from Zululand. The writer first became interested in this question in 1920, and during the succeeding ten years had opportunity to make enquiries in various parts of the Territory, with the object of discoveringsomething about the wanderings of the Angoi. The following account has been compiled from information obtained from native sources. Of necessity, much of the true story has been lost in the passage of years, but it is thought that the information now placed on record is, in the main, correct. The Angoni were known to Livingstone and his contemporaries as the Mazitu and Watuta, and they have frequently been described as Zulus. This description, however, appears to be incorrect since they were not, it is thought, Zulu, but Abe-nguni who had been resident in Natal as far back as 1620. They continued there until towards the end of the reign of the Zulu King, Chaka, with whom they became embroiled, with the result that they migrated northward under the leadership of Zwangandaba and crossed the Zambesi in November 1835. Continuing their journey northward and to the east of Lake Nyasa, they finally reached what is now known as Tanganyika Territory, somewhere between Lakes Nyasa and Tanganyika. They were exceedingly able warriors and had, it is believed, adopted the Zulu methods of attack. Throughout their joumey north they raided and subdued the people along their route: amongst these were the Swazi. Tonga and Kalanga. On reaching the country to the west of Domira Bay on Lake Nyasa they rested, and Zwangandaba establshed a headquarters or base from which he made an expedition to the southern end of Lake Tanganyika with the object, it is stated, of advancig along its western shores. In this he was frustrated by the poor nature of the country and by tsetse fly. Nevertheless, the expedition produced repercussions farther north, to which reference will be made later. Zwangandaba retumed to his base, and having rested and reorganzed, agai set out northward, but this time his object was the country on the eastern side of Lake Tanganyika: through Ufipa and beyond. The chief of Ufipa, Nsokolo, hearing of the threatened invasion, succeeded in coming to terms with the enemy, thus saving his people from the terrors of an Angoni raid. Zwangandaba was accompanied on the expedition by his brother Ntabeni, and by his two wives, the senior of whom had borne him a son, named Mpenzi, while the junior, whose name was Qutu, had borne him a son named Mombera. Both these lads were with the expedition. Shortly after reaching Ufipa, Zwangandaba died and was buried at Chapota, where his grave, marked by a grove of trees, can still be seen. On his death, Ntabeni, who had quarrelled with the successor. Considerable friction and internal strife resulted in a general break-up of the force. Mom- bera and Mpezeni returned south into Nyasaland, but two sections of Zwangandaba's following remained in Tanganyika Territory, and it is with the subsequent wanderings of these that we are now concerned. No further information regarding Ntabeni seems to be obtainable and his fate is obscure, but much is heard of the activities of his sons Mtambalika and Mtambarara, and Mbonambi, the wife of the former, who were the leaders of one of the two sections. They are first heard of at Mpimbue, at the north end of the Rukwa valley; only some fifty miles north of Chapota. They raided and subdued the Wa-pimbue and appear to have settled in that country for some time, for it is known that from there they raided into Ukonongo and as far as Ukabende, near Cape Kungwe on Lake Tanganyika. The inhabitants of Ukabende were the Baholoholo, who had but recently crossed the Lake, having been driven to do so by pressure from the south, which had its origin in Zwangandaba's abortive expedition to the western shores of Lake Tanganyika. The Baholoholo were brave and capable warriors, and under their chief, Swima, actually took the war into the enemy's country and attacked the Angoni at Mpimbue. They were beaten off and Swima lost his life, but they seem to have put up a sufficiently stout resistance to persuade the Angoni that there was nothing to be gained by attacking them again, for, when Mtamballka resumed his journey, he avoided Ukabende and, passing to the east of it, struck the Malagarasi valley somewhere about Uvinza. He then launched a series of raids westward towards Kigoma and attacked the Arab town of Ujiji. Here he suffered a reverse and so turned north-east through Uhaa and reached the Runzewe country, north-west of Tabora, where he settled down and established a base from which he raided as far north as the southern end of Smith Sound on Lake Victoria. At this time, about 1870, the notorious Mirambo was busily occupied with raids into Unanyembe (Tabora) and against the Arabs of that place. He and Mtambalika joined forces and the Arabs, who had organized an expedition against them, were defeated at Issasa Magazi. It was in this expedition that Stanley took part. Mirambo and his ally were defeated eventually and Mtambalika retired to Runzewe. He had two wives: Mbonambi and Nwasi. The former bore him one son, who died in childhood, but Nwasi bore four sons: Mpangarara, Mvumba, Mini and Muvi. The first of these succeeded his father and was in tum succeeded by his son Mtambalika, the present chief. Mtambalika died at Mgomba and was buried there, while Mbonambi died at Kungene, where her grave is still treated with respect and reverence. In spite of her ill-success in the production of children, she seems to have been as famous as her husband, and her name is remembered to this day from the Rukwa to Runzewe. The descendants of Mtambalika's followers are now considerably inter-bred with the people of Runzewe, and it is stated that they are beginning to lose their Angoni identity. The wanderings of the second section of Zwangandaba's following which remained in Tanganyika Territory are of no less interest. The leaders were Mboanani and Zuru of the Gamma clan. It is pos- sible, however, that the latter was of the Njere clan, for some informants have stated that his ' grand- father' was Njere or Njeru. On the break up of Zwangandaba's force consequent on the election of Mombera, Zuru and Mboanani led their followers south-eastward through Usafwa and into Ukinga and Upangwa in the Livingstone Mountains, raiding as they went. They finally reached the plains, in the neighbourhood of the place where the town of Songea now stands, and proceeded to establish themselves. They were not, however, the first Angoni to reach the Songea area, for they found there another party of Angoni under the leadership of Mputa, sometimes called the Smiter. Mputa was a Swazi of the Mseko clan who had been a member of Zwangandaba's original force and who had apparently broken away from it, after it had crossed the Zambesi. He came north up the east side of Lake Nyasa, and crossing the Ruvuma River, settled at the hill of Mbunga, about forty miles north-east of Songea, where he settled down and absorbed the unwarlike Wa-ndendahaulh, whom he found there. From Mbunga he carried out many successful raids northward and into the Kilwa hinterland. It is stated that he even raided as far north as the Digo country, a few miles south of Mombasa. Zuru and Mboanani seem to have entered into some kind of agreement with Mputa and to have lived at peace with him until he treacherously murdered Mboanani and attacked and defeated Zuru and his followers. Shortly afterwards he proceeded on an expedition against the Yao, south of the Ruvuma, and suffered a reverse. In the subsequent rout he was captured by a party of Mboanani's followers who hanged him out of hand on the roadside. It is related that his body was taken to his 'great place' at Mbunga and there burnt, but another account states that his followers dammed the Ruhuhu River, wrapped the body in an ox-skin, burnt it in the bed of the river and allowed the waters to flow over the remains. There seems to be little doubt that Mputa's body was cremated, but whether at Mbunga or in the bed of the Ruhuhu needs further confirmation. At this late stage it seems doubtful if reliable information on the point can be obtained. On the death of Mputa the Zuru party reorganized, and delivered a successful attack against Mbunga. Mputa's followers were heavily defeated and fled in all directions. The pure-blooded Swazi fled south across the Ruvuma, while the half-bred Swazi-Wa-ndendahauli fled north into Mahenge, where they founded the tribe now known as Wa-mbunga. The Wa-ndendahauli serfs fled east into Tunduru, where they still cherish their acquired Angoni status. Mboanani was succeeded by his son Chipeta, and he and Zuru established a dual control over the country lying between the Pitu and Ruvuma rivers. They raided in Ukinga and Upangwa and on the shores of Lake Nyasa, where Zuru's third son, Muharule, is well remembered. At Kipingo, a few miles north of Manda on the lake shore, may be seen the remains of a pile village, which the Wakissi of those parts state was built by their fathers as a refuge from the Angoni, who were reputed to be averse from entering or crossing water if they could avoid doing so. Muharule also raided into Uwungu on the eastern shores of Lake Rukwa. He succeeded Zuru on his death, and was himself succeeded by his nephew, Chabruma, who was later deposed and replaced by Usangila, the son of Muharule. After the rebellion a number of minor chiefs came into being in Songea. They were for the most part sons of the Zuru and Mboanani families, and although in the course of time they became semi-independent,the administration of the tribe remained largely in the hands of the alien native Akidas, appointed by the Government as its agents in the outlving districts. Among these minor chiefs or sultans, as they came to be called, was one who was not a member of the old ruling families. He was Songea, an Mkaranga Nduna of Muharule, and it was from hini that the town of Songea took its name. Since the war a policy of indirect rule has been inaugurated and the internal struicture of the tribe has been, to some extent, reorganized, giving the direct descendants of Zuru and Mboanani that recognition to which they are entitled, while the exact status of the minor chiefs has been defined. The Angoni continue to be wanderers, and large numbers of them leave the Songea and Kahama districts every year, making their way to the Tanga district, where they obtain employment on the sisal estates and where they are regarded as first-class labour. Many of them settle down and never return home, or only do so after a lapse of years. They retain, however, a marked pride of race and have no doubts whatever regarding the inferiority of other tribes in the Territory.